Thank you very much for your feedback and for your kind words, Bamse I really apreciate it! Yes, the save score feature is being included in future releases (at least Kai Magazine releases). You're more than welcome, the praise is deserved. I just ordered two cartridges and am looking forward to playing this game. C'mon folks,lets get this thing sold up to 140 I would love to get some boxes made for this! @cvga This happened to me on mobile as well as an older version of Firefox. I just tried on my Windows 10 box and it worked fine. Are you checking out as a guest or a returning customer? FWIW, in all three cases, including the last one which worked, I was checking out as 'guest'. I initially tried as a guest. When that didn't work, I registered and tried as a returning customer. I had the same result either way. I switched browsers today (after reading your response) and it worked. Thanks for your help! I think I posted earlier that Microsoft Internet Explorer had troubles editing the discount. When I changed over to Microsoft Edge, it worked with out a flaw. So the problem is potentially cause by a browser. All current orders are shipped. We are a long way away from reaching our goal of 140 to produce a box. Through secret channels, a preliminary box design has surfaced. YES! I'd buy that in a heartbeat! Damn, I miss Chris Farley. He was always one of my favorite comedians. Game arrived. It would have been nice if Pressing 1 for pause would mute the audio as well. Any manual for the game? The people from the remote village of Teguma have always lived in peace and harmony. However, a few weeks ago all the animals in the village began to act aggressively and started attacking the villagers without provocation! Shortly after, the villagers started to feel weak and sick, as if their life itself was being sucked out of them! humans in order to come back to life. The young Ninja Kasuhiro Kun still stands! Kasuhiro Kun must travel to the 3 temples in order to defeat the ghosts before his life force is drained completely! And now, the biggest odyssey of his life is about to begin! Take on the role of Kasuhiro Kun and help him on his quest to defeat the evil ghosts and save the village! DISC: Use the disc to control the Ninja. Pressing the disc can also bypass the splash screens. SIDE BUTTONS: Use the side buttons to start the game, jump and shoot. Pressing the jump button quickly will perform a normal jump. Keeping the jump button pressed longer will perform a higher jump. KEYPAD: To PAUSE the game, press keypad 1 during the game. Optionally, you may use Keypad 7 for jumping and Keypad 8 for shooting. Press CLEAR as you start your master component in order to clear the high score table. Insert the game cartridge. You may bypass the Elektronite and Kai Magazine splash screens by tapping the disc on either controller. To start the game at the title screen, press any side button. During the game, you can pause and un-pause by pressing keypad 1. Get to the end of each sub-level before your soul gets drained! Defeat the ghosts and save the village! Move the ninja from the left screen to the right, avoiding dangers by jumping and shooting at enemies. Keep a careful watch on your 'life bar' during your odyssey! You will encounter various items that you can pick up. You will also encounter a variety of enemies and threats during Kasuhiro's odyssey! -Hearts: Pick up one to recover a piece of your soul. -Red Ninja Star: The red shuriken bounces on floors or walls. -Yellow Ninja Star: The yellow shuriken is faster and has a longer reach. -Grey Ninja Star: Default weapon, there are no advantages. -Red Suit: Allows Kasuhiro Kun to double jump in mid-air (the ability to jump a second time in mid-air) If Kasuhiro Kun gets hit by a non-lethal enemy (ground spikes, flying black stars) he will lose the red suit! -1UP: The 1up item grants the player with an extra life. -Pike Traps: Jump over them in order to avoid hurting your feet! -Snakes: jump over them or kill them. If you come in contact with them you will instantly die! -Fires: Jump over them with enough speed. If you come in contact with them you will instantly die! -Black Wolf: Jump over them or kill them. If you come in contact with them you will instantly die! They only appear when you approach a small wolverine in order to defend it's kin. -Frogs: Run below them if you have enough speed, or jump over them or kill them! If you come in contact with them you will instantly die! There are at least 3 ways to get rid of this particular threat. One of them involves killing them by doing a clever maneuver with a jump and shurikens before the frog starts jumping but it is only for "pros"! -Octopus: He will wait for you to come close before jumping at you. Jump over him or kill him! If you come in contact with him you will instantly die! -Bats: Jump over them, run below them, or kill them. If you come in contact with them you will instantly die! -Black Floating Spikes: Magical traps which usually appear in swarms. Avoid them or kill them in order to avoid damage to your soul, but use them strategically sometimes to get across dangerous cliffs or reach interesting items. -Fire Balls: Jump over them, run below them or kill them! (3 hits) If you come in contact with them, you will instantly die! you come in contact with them you will instantly die! -Ghosts/Final Bosses: Avoid their flame attacks and hit them many times with your shurikens! Having Double Jump and bouncing or long range shuriken will help a lot! Once the player defeats the ghosts, and finishes the game, there will be an ending sequence. Once the sequence is over, the game will start again with a higher level of difficulty, so the player can keep trying to reach a higher score! • Level 3-1 is the hardest, not because it's difficult (though it is) but because you can run out of time easily. Don't kill all the black spikes, you don't have time! • You can kill the fireballs! Very important for level 3-4! • On Level 3-4 make sure you get both the double jump and the fast stars, the boss is incredibly difficult without them! Even if you damage yourself getting the fast stars they're worth it. There's a lot of hearts in this level so it's no big deal. • To get the double jump in 3-4, gingerly climb the block to the right of it making sure you don't let it go off screen, then jump back to get it. 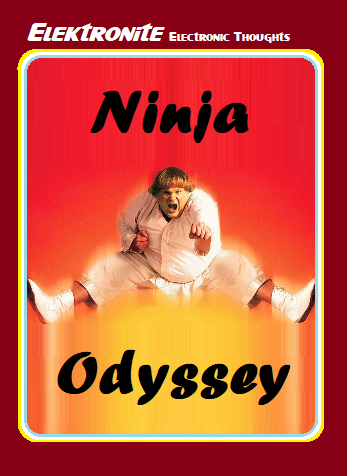 Ninja Odyssey was developed by Kai Magazine and published by Elektronite! Copyright © 2019, Classic Game Publishers, Inc. All Rights Reserved. Thanks for the manual. I've noticed using jump things (level 2) is a little confusing to use. Bigger issue is using Red Suit for double jump is off on level 2. Level 1 the Red suit works great. Level 2 not so much, its almost like jump button becomes non responsive in this area. Can anything be done to fix this? I think what is throwing me off is the control. It's sort like the Ninja has to get momentum towards the direction first and if doing mid-air double jump with a direction shift, the Ninja doesn't really move how you expect and ends up falling down. It takes some time getting use to. I can get to fireball level in Round 2. Getting better at the game, much easier to skip using the jump things and just use Red suit. Got to level 3 now. We have tested it on many Intellivision models and regions and we never experiencied such issues. Hi Grips, the game engine is the same for all the stages and levels, and there is nothing in the code which could cause a button not to respond as good as before. It is more likelly that your finger gets tired after a while after so many presses, since that happens to me too. The intellivision controller side buttons are very hard. I suggest you press "1" key and take a break every once in a while. You can also try to play with your second controller and see if the button is not as hard to press as in the controller you are using now. It seems there are problems with different web browsers. Take a look at page 1 of this thread. It looks like some browsers don't work fine. Please try Microsoft edge if you are on windows 10 or chrome if you are with the phone.